We started off our star wars birthday decorations with getting everyone into the spirit of star wars training with a three quarter length door poster of Yoda on our front door to usher into our home our invited Star Wars Jedi knights. We also had a speaking plush Yoda that sat in our home until he would be brought outside for the Jedi training obstacle course where Yoda would have to be carried safely on each Jedi trainee's back through the obstacle course to safety. It also became a take home gift for the birthday boy. 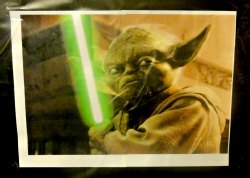 Right down our hallway at the far end of our living room we had a picture of Yoda with drawn lightsaber that we covered over with cleartack to give it a poster quality to use for one of our party activities 'Pinning your lightsaber onto Yoda's green lightsaber'. Our living room wall was outfitted with a centered full movie poster on a large star studded blue velvet drape. After the present opening we took pictures of each gift with the gift giver to include in each thank you card. We finished off our wall decorations with a full banner to celebrate our birthday boy's day. 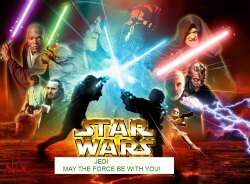 We made some large print text with some star wars pictures on our computer, pasting it onto a meter wide heavy, solid color wrapping paper. We usually like to add a cleartack covering to our birthday party banners but as you can see we didn't this time around and used some streamers to attach a few balloons. 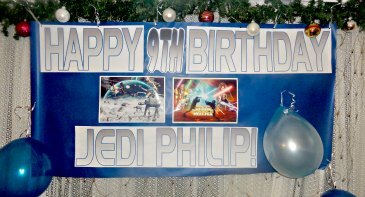 All of these 'poster' pieces brightened up our star wars birthday decorations for our boy's party. We had quite a spread of food platters for our Star wars Jedi knights celebrating our son's birthday from pizza, sushi, tangerines, veggie platter to assorted chips, pineapple-Grapes spears and the imperial and resistance cupcakes. We found a simple tablecloth with Darth Vader head outlines in white on a sky blue background matching up with the star studded blue drape and our blue background banner. The cupcake toppers were cutouts of stormtroopers, Darth Vader, Luke Skywalker,Princess Leia, Yoda, Hans Solo, Chewie and we also got a couple of sets of red, green and blue lightsaber toppers. We used our grab bag picture on our banner because it just looked great with awesome color contrasts and the colored lightsabers from both sides of the Force. We added some text for each Jedi knight that attended our star wars birthday party with: Jedi, May the force be with you! 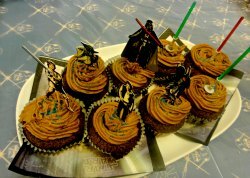 The kids enjoyed them and these were pretty easy additions to add atmosphere to our star wars birthday decorations. 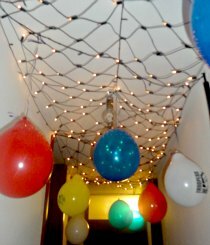 We added some star wars balloons on the ceiling above our lava pit which ran the length of our side hallway for our Jedi knights in training to practice their prowess walking from lava stone to lava stone over the whole length of the 'lava flowing' river. 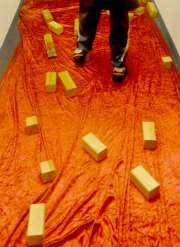 We used a red velvet fabric roll and had building blocks play the roll of the lava stones fro crossing. The balloons were imprinted with star wars pictures and hung from a net of lights to represent the star studded skies. I am going to call these next two Interactive Birthday Party Decorations because they were all made and created for each one of our Jedi knights in training that attended our son's Star Wars Birthday Party, and of course they were used and worn. 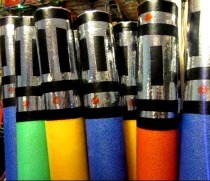 We made a full set of 16 pool noodle star wars lightsabers for the party(I made an extra 4 after the party) in green, yellow, blue and red. Each of our Jedi knights received their own lightsaber upon completing the training obstacle course activity. These lightsabers turned out great, this really was an awesome addition to our star wars birthday decorations and each child got to take their sword home with them. They loved it, and talked about it even weeks later. If you do a star wars theme, you have to make these ones--it is well worth it. 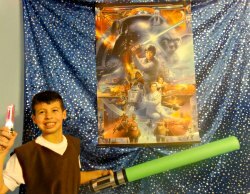 Check out all the activities we ran through for our Star Wars party. I made the hilt or handle using electrical tape and silver duct tape measured out for each half noodle. I will post a complete how to make them in a step by step guide for you and I will also put a video together--they do require a bit of patience, with measuring making it easier but they turn out great and are lots of fun. All of our kids still love dueling with them--and it's really hard to get hurt with them, what a parenting dream. 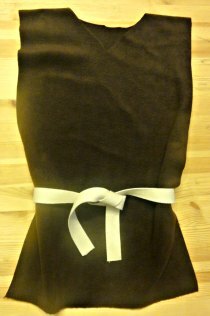 My second creation for our birthday participants were Jedi knight robes with belts to tie around their waist. They received them after the free sword play following our training session with our guest Jedi: Obi-Wan Kenobi. I will post some pictures on how to make these quick and easy Jedi knight robes that are sleeveless and need absolutely NO SEWING! After presents and food, while waiting for all of our Jedi knights to be picked up, the final face-off battle with Darth Vader took place in our home and all the knights loved their take home party decorations of colored pool noodle lightsabers and Jedi knight robes to attack and overcome the dark forces of Vader. The party went great with all of the star wars birthday decorations and activities. We even had Princess Leia herself helping to serve the Jedi in training alongside Obi-Wan and Darth Vader. The kids all loved it and had a great time. Actually...we had a really great time too.